Simplicity Sofas, a High Point, NC manufacturer of high quality Self-Assembly sofas, chairs & sleepers, has announced a unique new product warranty program, guaranteeing complete customer satisfaction. Jan. 23, 2010 - PRLog -- Jeff Frank, owner of Simplicity Sofas, announced today that Simplicity Sofas will offer the strongest warranty program in the furniture industry. Customers must be completely satisfied with their furniture or they may return it for a full refund, including shipment costs. Mr. Frank stated that this new warranty policy is not really a major change for the company. "We have always operated under the philosophy," he stated "that we will do whatever it takes to make our customers happy." The official company warranty up to this time had been similar to other furniture retailers. There was a lifetime warranty on the solid oak frames, a 3 year warranty on cushions and a 1 year warranty on fabric. If customers wished to return undamaged furniture within a 30 day time period, company written policy specified that customers were responsible for return freight. "The only problem with our written policy, " Mr. Frank said, "was that we didn't follow it. Whenever a customer problem occurred, we took care of it, regardless of what our written warranty stated, and regardless of the cost incurred. In my opinion a single unhappy customer can cost the company thousands of dollars in lost future sales, while customers who are not just satisfied, but enthusiastically delighted with our products and with the service they have received, are our most important source of advertising." Mr. Frank developed this customer service philosophy over 35 years in the furniture industry. Early in his career he spent 8 years as a manager with a large retail furniture chain that was plagued with customer complaints and problems. "That was not fun," he said. Many years later, he spent 2 years as a volunteer with "Call for Action," http:www.callforaction.org a non-profit consumer help organization at which Mr. Frank helped hundreds of consumers trying to resolve frustrating disputes with retailers and service organizations. "These consumers were so angry." Mr. Frank recalled of his Call for Action days. "You would hear about how they were never going to shop in that store again, and how they had told everyone they knew about their unfair treatment. Even when you resolve the complaint at that point, the damage to the reputation of the company has already been done. If the company is big enough, they may not care right away. But a small business who allows its customers to feel unfairly treated is asking for long-term trouble. Take something as simple as issuing a refund after a product has been returned. Why should a refund take weeks to process. There's no good reason for that. At Simplicity Sofas, refunds are issued the same day the furniture is returned. " Mr. Frank was asked whether he thought other Furniture companies would follow his lead and also adjust their warranty programs to compete with his. "No," he responded. "Simplicity Sofas has a unique advantage. We are the manufacturer selling direct to the consumer. Whenever we ship furniture, we send an immediate follow-up email to the customer asking if everything is OK. If there are any problems we follow up immediately. We can replace a complete sofa in 10 days if necessary. Contrast that to the customer who has bought their furniture at a retailer. When have you ever had a follow-up call from your furniture retailer asking if you were happy with your purchase? They are afraid of what the answer might be. Any problems and solutions have to be coordinated between the retailer and the manufacturer. Who is going to take responsibility? How long will it take to fix the problem? How much will it cost? Who's going to pay? What happens is that you have an adversarial relationship going on in most cases with the customer against the retailer against the manufacturer. Warranties in that scenario are designed to limit costs to the retailer and manufacturer, not to solve the problem in the most expedient manner for the consumer." Another advantage that Simplicity Sofas has which permits it to liberalize its warranty terms is that it has very few returns and a much lower percentage of damages than other furniture companies. Every piece of furniture is custom made specifically for one individual customer. It is manufactured, then boxed, then shipped out the same day direct to the customer's door. The furniture does not sit in large warehouses waiting to be transferred. In addition, other manufacturers and retailers usually ship sofas with a plastic or paper wrapping. At Simplicity Sofas each item is carefully packed and boxed in heavy duty double walled cartons with reinforced edges. " We have a lot of customers who tell us it takes longer to unpack the boxes than to assemble the furniture" Mr. Frank said. When freight damage does occur, the patented modular construction allows individual components (arms, backs, bases) to be replaced without bringing the entire piece back to the factory. Mr. Frank was asked one final question, "Your new warranty doesn't state what the time limit is. If someone calls you up 20 years from now and says that they are not happy with their couch, are you going to give them a full refund?" Mr. Frank replied, "First of all, I don't think we have the type of customers who would do something like that very often. The only actual case was a couple who asked to return their sofa after 5 months because their friends told them it wasn't comfortable. We took it back for a full refund which we issued the same day the sofa reached our factory. On the other hand, can you imagine the advertising value if we were able to send out a press release saying that we gave a customer a full refund for a 20 year old sofa? That's L.L. Bean-type service and that's where we want to be." About Simplicity Sofas http://www.simplicitysofas.com is a High Point, NC manufacturer selling unique patented Self Assembly sofas, sleepers and chairs. Unlike conventional knock-down and ready-to-assemble sofas, Simplicity Sofas makes a premium quality product using only 100% kiln-dried solid oak frames. No plywood, particle board or chip core is used in any Simplicity Sofas product. Each item is hand-built, one piece at a time, by skilled craftspeople. This is not mass-produced furniture. 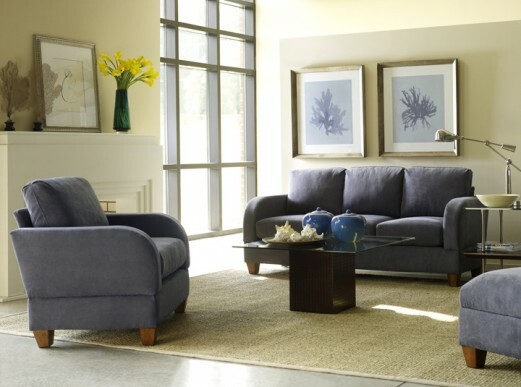 Custom options include a choice of 100 fabrics, 3 cushion firmnesses, tailored slipcovers, and hard-to-find sofa sizes. All Simplicity Sofas furniture assembles in about 15 minutes with no tools needed and is shipped throughout the US by UPS Freight Service. The Simplicity Sofas Warranty policy is simple -- If you do not like your furniture for any reason, return it to the factory for a full refund including shipping charges. Yelp! -- Too Good To Be True?